To make sense of how an real estate investor could make more income when financing real estate properties, there are many variables to consider. Let’s keep things simple at first and go over the example below. Our real estate investor in this scenario is Samantha. Rental houses where Samantha lives cost $90,000 each + $4,000 in Buyer’s closing costs. They can rent out for $1,100 per month. Samantha has enough money to either buy one house all cash, or she can purchase four houses with 75% financing. In the chart above, we can see that if Samantha’s plan was to hold her properties for MORE than 2 years, than it would work out in her favor to own four of them. The graph lines start out in the negative when factoring in the $4,000 per house for closing costs, and at the intersection point around year 2, Samantha’s choice of 4 houses would greatly start out-earning her alternative of 1 house. 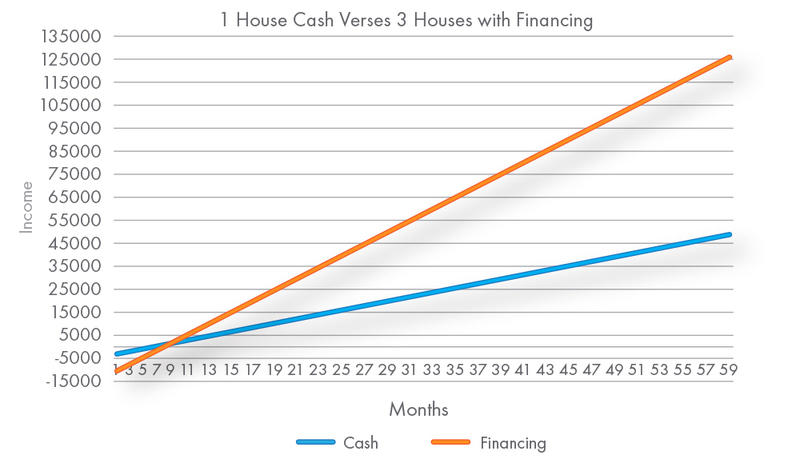 After this point, she will continue to earn more throughout the life cycle of her real estate investment, and reap the benefits of choosing the cash on cash financing option. Investors can also use leverage as a tool to invest into better quality real estate assets. We can look into another example deal with our Investor Samantha, and see how she may be able to buy less volume of real estate properties and still make a great return. With cash on cash financing, Samantha is able to invest in a few slightly higher priced neighborhoods compared to what she could afford to invest in with all cash. As mentioned, this can be a key factor to unlocking potential greater returns often unrealized in typical rental property income projections (like in our first example). Let’s add in some more factors, and take a look into how these benefits can translate into higher returns. In this example, instead of 4 houses of the same value, Samantha instead wants to consider purchasing slightly higher priced houses that come with the benefits mentioned above. She wants to consider a purchase of three homes for $120,000 that rent out for $1,400 per month. To check out her expected returns, let’s ONLY assume out of all these benefits that they add up to 10% less vacancy for Samantha and only 10% better appreciation. 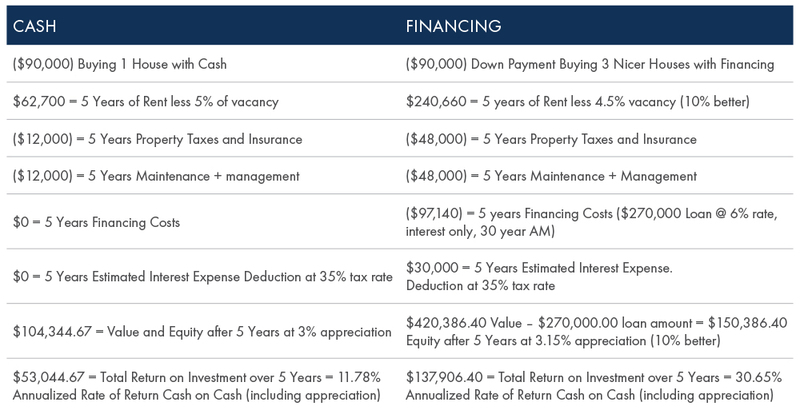 As we can see this conservative list of only two 10% improvements, coupled with business tax deductions for interest expenses when financing adds up to some big differences in income for Samantha when we look at her investments over a 5-year period. Leveraging 3 houses could mean income over $135,000 for Samantha, whereas buying the one house in cash may only result in just over $50,000 in income. In full disclosure, I am not an accountant or financial advisor and I would recommend that all clients check with professionals in these areas prior to making any financial decisions. What I can say is that I have helped many clients utilize real estate financing to buy more volume and better quality assets throughout my career.